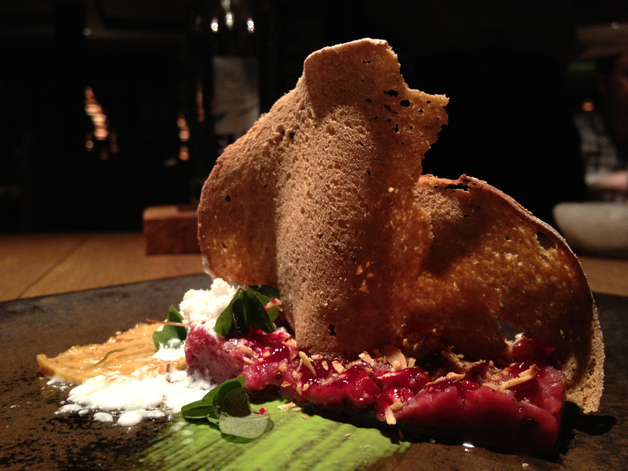 Tom Aikens Restaurant review – Kensington’s best restaurant? There’s no shortage of expensive restaurants in Kensington and Chelsea, which isn’t surprising given the affluent locals. High prices are no guarantee of quality though, so I was fully prepared for an evening of disappointment at the simply named Tom Aikens Restaurant. I needn’t have worried. Tom Aikens used to be a fairly formal-looking place with white tablecloths, but all that has changed following a months-long refurbishment. 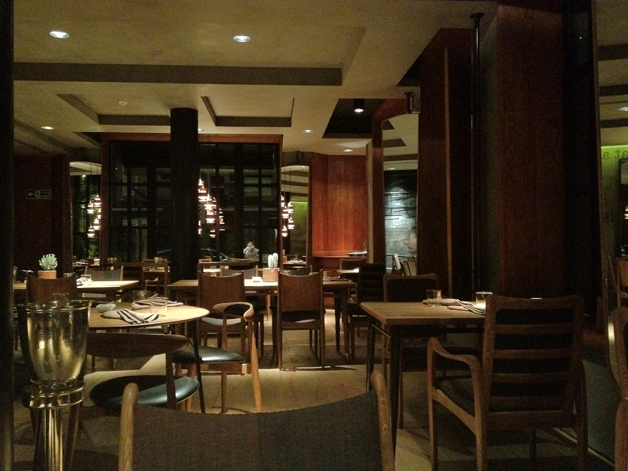 The dining room is dimly lit with plenty of handsome bare wooden tables and wood panelling. It’s not the most original look, but it’s all very polished. The service is just as seamless – attentive and friendly, the waiters appear to effortlessly fade into the inky blackness between the tables after serving you. The serene atmosphere was ruined only by the braying and clattering of the Malcolm Tucker wannabe on the other side of the dining room. Although it’s possible to dine for £50 on the three course a la carte menu, I’d recommend against this. 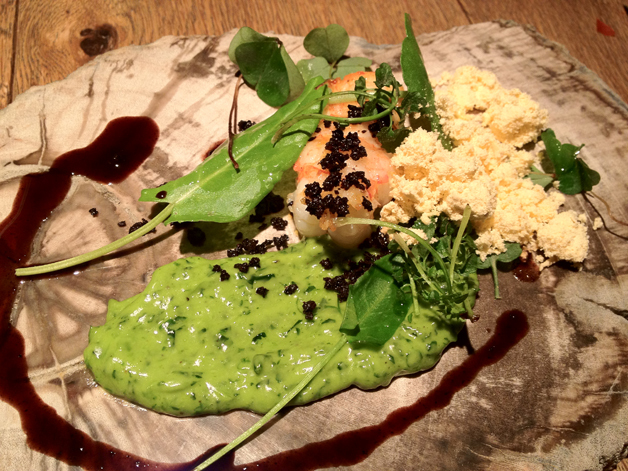 Each course is rather small and is really designed to be consumed as part of a much larger tasting menu. Six courses for £55, eight courses for £75 and the full ten courses for £95. I chose the ten course option, but you should only do this if you have had a light lunch and have plenty of time to spare – I was stuffed to the hilt by the end of the three-to-four hour experience (Cheese and Biscuits has a review of the six-course version, which shares some of the same dishes as the ten course dinner, if you’re interested). 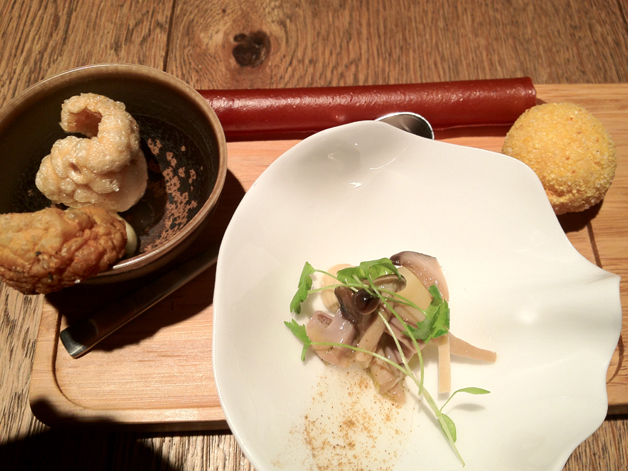 The kitchen’s creativity is evident just from the amuse bouche. A red candy-like roll is actually made of red pepper and despite its confectionary-like appearance, the distinct taste of red pepper is obvious with every bite of the crumbly roll. The grainy and gritty parmesan and polenta ball isn’t as successful – although it successfully captures the texture and taste of polenta, the parmesan barely has any presence. Far more interesting are the firm, slippery slices of mushroom served in a tart, creamy foam. The last of the four amuse bouche are what are described as pork and chicken crackling with mayonnaise, although they’re really best described as pork and chicken scratchings. Overall, a tantalising start to a meal. So amusing, I'm positively giggling! 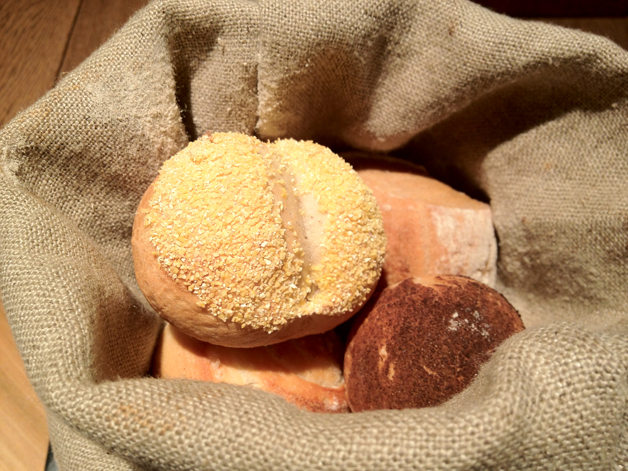 In a whimsical touch, the selection of bread for the table arrives in sackcloth. Although the warm and fluffy semolina roll was especially enjoyable, the bread selection would be nothing without the accompanying blobs of flavoured butter. The usual lightly salted variety is joined by an earthy cep mushroom version, but both of these are overshadowed by the bacon and onion butter which somehow successfully combines the flavours of smoky, crispy bacon with that of caramelised onions in butter form. You know you’re in for a treat for the rest of the meal when the bread and butter gets this much care and attention. After the varied, bold flavours of the amuse bouche and the bread and butter selection, the next course was thankfully refreshing. The very thinly sliced scallops are marinated in an apple vinegar which gives them a gently tart yet sweet flavour, which is just as well as there isn’t enough actual scallop to enjoy. 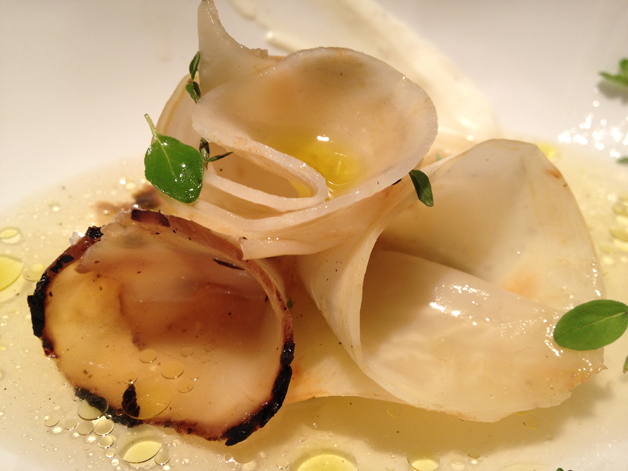 More prominent is the fatty slice of lardo crudo which wasn’t too salty. 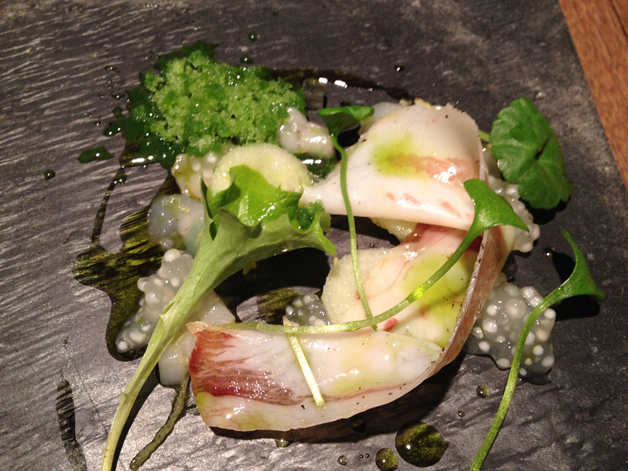 The most refreshing, but also most outlandish aspect of the meal was the tarragon granita. The icy cold taste of the herb was interesting, but seemed a little out of place with the other ingredients. The lone roast langoustine looks laughably small when surrounded by all its accompaniments. Even so, it was firm and juicy with a clean aftertaste that was complimented well by the boldly flavoured dill cream and gently salty black olive crumb. Following my disappointing encounter with the seared foie gras at Les Trois Garçons only a few days before this meal, I expected to be similarly disappointed by the roasted foie gras here. I shouldn’t have been so silly. The foie gras had a delightfully light and fluffy texture which was quite a contrast to the rich, creamy and fatty taste which was balanced out by a slightly sweet tinge courtesy of the apple glaze. 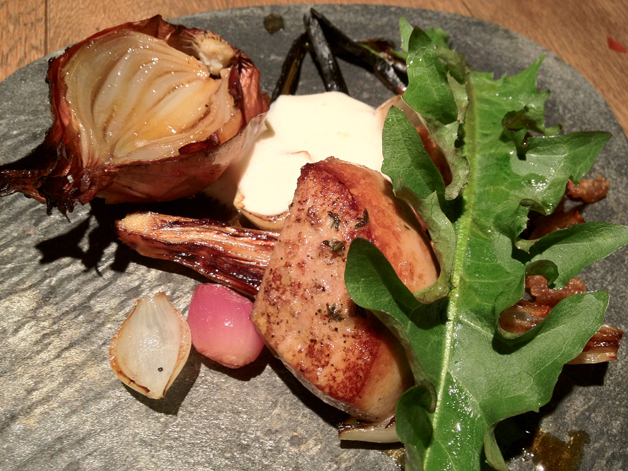 Even better were the variety of smoked onions accompanying the foie gras from a sweet and mellow variety to a much sharper version that had a wasabi-like nose burning effect to it. 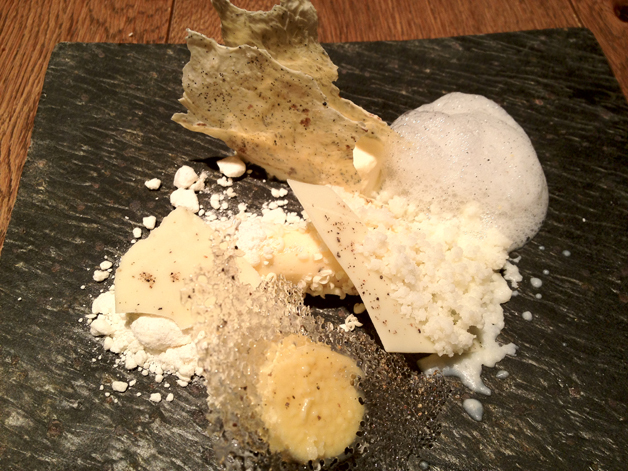 Excellent stuff – my second favourite course of the evening. One of the finest foie gras dishes I've ever had. Despite the tender, almost puréed form of the venison tartare, the meat hadn’t lost any of its denseness and had a dark nuttiness to it that was accentuated by the creamy hazelnut purée. The liquidy horseradish mayo was very mild though and seemed like an unnecessary inclusion to me. I was fully expecting the roasted foie gras to be my favourite dish of my evening at Tom Aikens, but even that excellence was upstaged by the chargrilled and baked celeriac. The textures of the delicate-looking vegetables varied from firm and almost crisp to soft and yielding, while the truffled creme fraiche added an intensely creamy richness to it all. That richness is balanced out by the light, herby, zesty, refreshing and positively lip-smacking consommé. I had to restrain myself from picking up the bowl and slurping it all down in one go. Excellent stuff. I’m getting slightly bored of sea bass (first world problems eh? 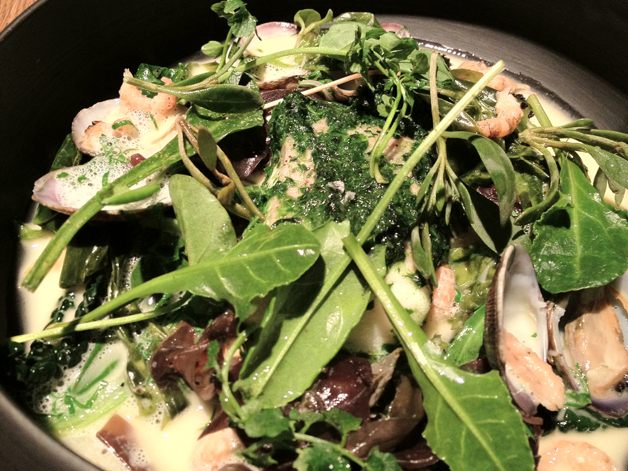 ), but the version here held my interest if only because there’s so much going on in one bowl. The texture of the light and tender bass was almost flaky and had a sweet and herby crust. This was balanced out, both in terms of taste and texture, by the firmness and sharpness of the bitter leaves, fungus and sprouting broccoli. The small clams were rather tasteless though. Yes, there is actually a fish fillet underneath all of that. At this point in my meal I should’ve learned not to underestimate the ability of the kitchen, but I foolishly questioned what could possibly be done with Romney lamb that could pique and hold my interest. I should’ve had more faith – the pink slab of lamb almost resembled rabbit with its firmness and tangy moreishness that was accentuated by the creamy garlic and anchovy dressing. Surprisingly good. Romney lamb - not Romulan lamb. I don’t usually order cheese at restaurants since I like to gorge myself on the stuff until I pass out, something that can only be done economically in the confines of my own home (or perhaps in the Jolly Giant’s home). 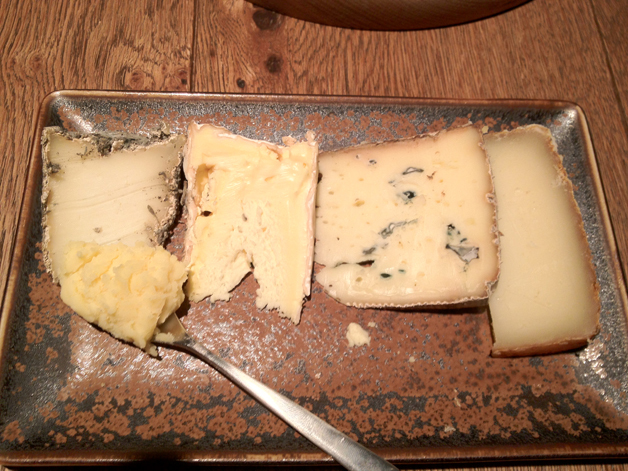 Cheese was included as one of the courses here and one of the two that stood out was the blue cheese which seemed mild at first, but had a surprisingly smoky aftertaste (if only I could remember the name of the stuff). The other standout was the Hundred Dram Cheddar which is one of my favourite cheeses and deserves to be more widely appreciated. The characteristic sharp tang of Cheddar was a little muted in this example, but it still had the unusually soft and creamy texture that distinguishes this type of cheddar. The least successful dish of the evening was still one of the most interesting. The selection of various white chocolate desserts on a plate was a smorgasbord of tastes and textures, but with so much going on it was a little overwhelming with no central focus. Having said that, the white chocolate and pepper foam stands out if only because of its unusual but complementary combination of flavours, while the silky parfait has a buttery taste that almost resembles clotted cream. The follow-up dessert initially appeared just as disjointed as the white chocolate selection, but somehow all the disparate elements came together. 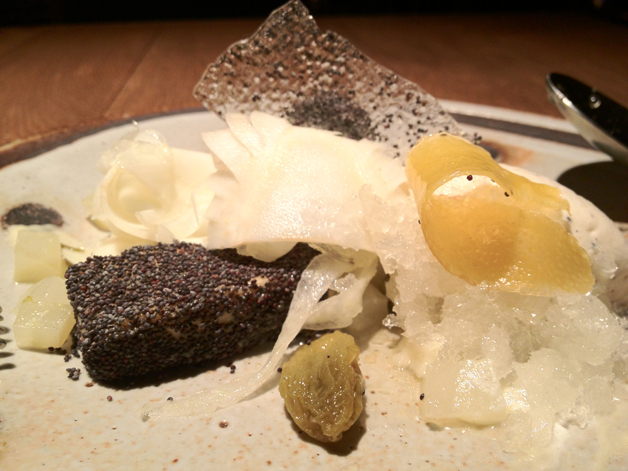 Several elements had bold and strident flavours, such as the sticky and syrupy honey, the pungent goats curd covered in crushed poppy seeds, the whiskey soaked raisins and the a fudge-like parfait coated in poppy seeds. These were balanced out by more refreshing, palate-cleansing flavours in the form of a lemon sorbet and Pernod-cured fennel. The latter is an especially odd addition and although firm with an oddly citrus-like taste to it, the dessert would probably still have worked without it. 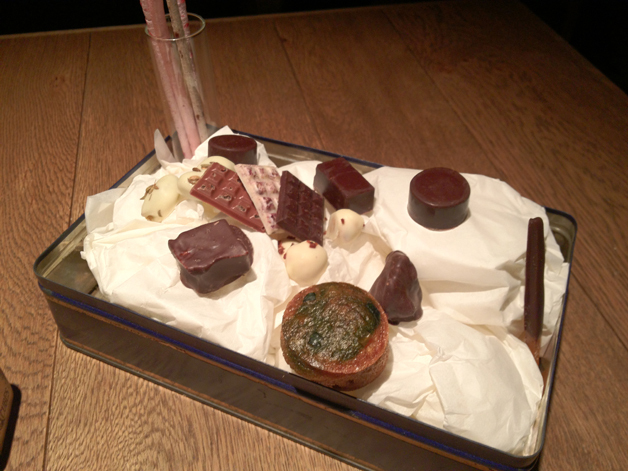 If all that sweetness wasn’t enough, a diabetes top-up arrived in the form of the petit fours. 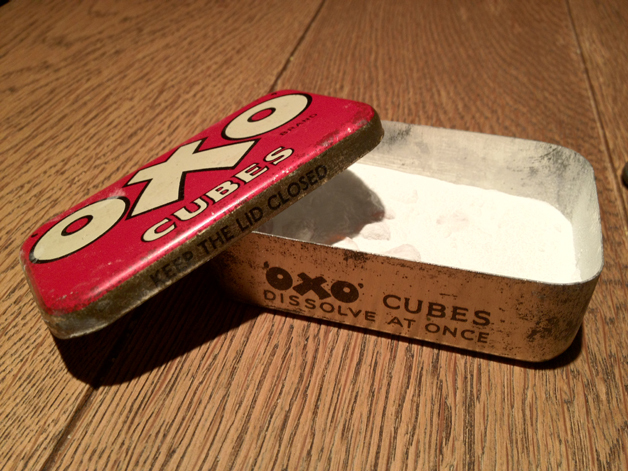 The strikingly sweet and tart candied fruits were served in a vintage Oxo tin, while the rest were presented in a biscuit box. Besides the candied fruits, the most memorable petit fours included the fluffy mini carrot cake, the breadstick-like meringues and the candied orange pieces covered in bitter chocolate – my favourite out of the whole lot. Is there a Maru in that big ol' box? If only Oxo tasted as good as these little candied fruits. 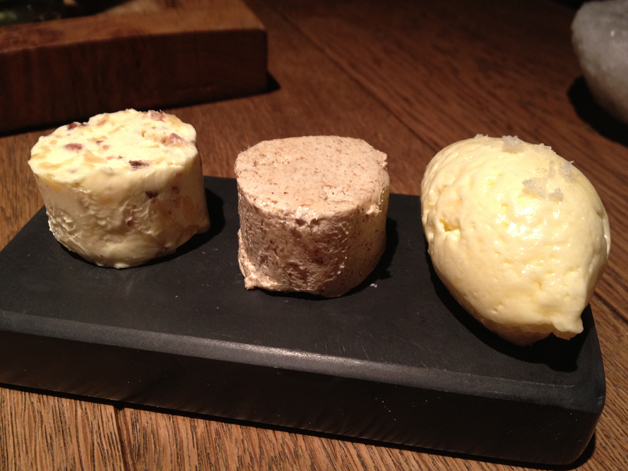 This is the easiest Verdict I’ve ever had to write – the cooking at Tom Aikens is inventive and delightful. Although the food isn’t a complete triumph with some minor missteps here and there, when you mix in the attentive service and the serene surroundings, eating at Tom Aikens is one of London’s quintessential fine dining experiences. Just be prepared to leave several pounds heavier and several pounds poorer. Opening Hours: Lunch Monday-Friday noon-14.30 (last orders for tasting menus 13.15) and Dinner Monday-Saturday 18.45-23.00 (last orders for tasting menus 21.45). Tags: amuse bouche, bread, broccoli, butter, celeriac, cheese, chocolate, clams, consomme, crackling, curd, fennel, foie gras, honey, ice cream, lamb, langoustine, lardo, london, mushrooms, onions, parfair, pernod, poppy seeds, raisins, red pepper, restaurant, review, scallops, scratchings, sea bass, tartare, venison. Bookmark the permalink. 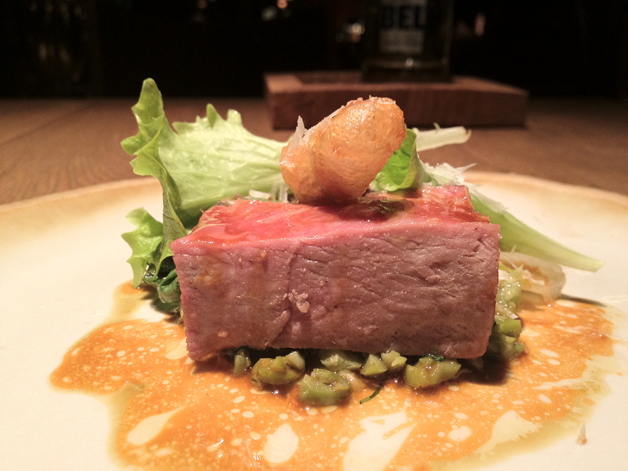 Previous post ← Trois Garçons review – oddball French worth the money?